Ever wished you could have a cheat sheet of all the handy Revit shortcuts? We’ve got your back! Hyperfine has been kind enough to put together a video of all the best shortcuts you need to know. Check out this article to see a list of 50 basic tools and commands for Revit! 1. Align (AL): Type. “AL.” Click on an object. Then click on the object you want to align to the first. 2. Array (AR): Click on the object. Type “AR.” Type in the number you want including the one you have selected and hit “enter.” Click anywhere and drag in the direction you want the array to go, then type in the value you want. 3. Place a Component (CM): This is a shortcut to place any type of component in your project (toilets, refrigerators, casework, etc.). Use the search bar in the left properties box to quickly find what you are looking for. 4. Copy (CO): Select an object. Type “CO.” Click and place the copied object where you want it. 5. Create Similar (CS): Click on an object. Type “CS.” Click where you want to place your new object. 7. Dimensions (DI): Type “DI.” Click on the beginning point you want to measure from, then drag and click on the ending point. 8. Detail Line (DL): Type “DL.” Click where you want to begin the detail line. Then drag and click again to draw the line. 9. Mirror (DM): Select an object. Type “DM” and draw the line you want the object to reflect over, or type “MM” to select an existing line. 10. Door (DR): Type “DR” to place a door. 11. Override Graphics in View by Element (EEE): Using this shortcut will only affect the objects you have selected. 12. Edit Type (ET): “ET” Select an object. 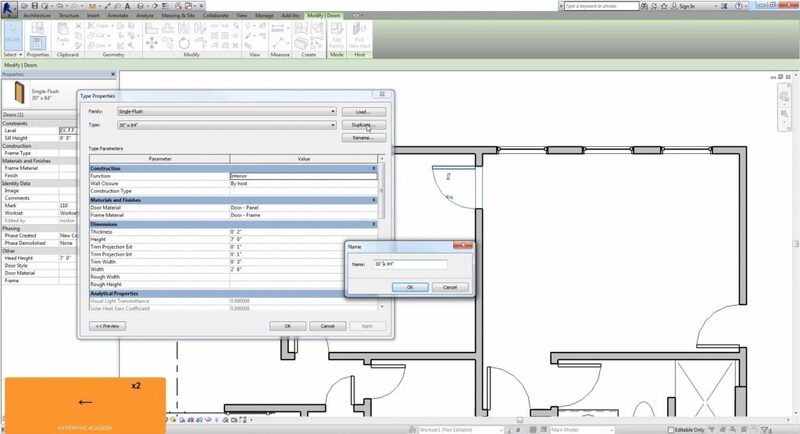 Type “ET.” To avoid altering every object in your Revit model, duplicate the object so you only change the settings of the one you have selected. 13. Filter Selection (FFF): Select everything in your view. Type “FFF.” Use the dialog box to select only the objects you want. 14. Grid Lines (GR): Type “GR.” Click anywhere to start drawing your grid line. Drag and click again to finish it. They automatically number sequentially, so make sure you start with the number you want. 15. Temporarily Hide a Category (HC): Type “HC” then select the category you want to hide. 16. Temporarily Hide an Element (HH): Type “HH” then select the element you want to hide. 17. Temporarily Isolate and Element (HI): Type “HI” then select the element you want to isolate. 18. Reset Temporary Hiding Settings (HR): Type “HR” to reset the previous hide commands. 19. Half Tone an Element (HT): Type “HT” then select the element you want to halftone. 20. Half Tone a Category (HY): Type “HY” then select the category you want to halftone. 21. 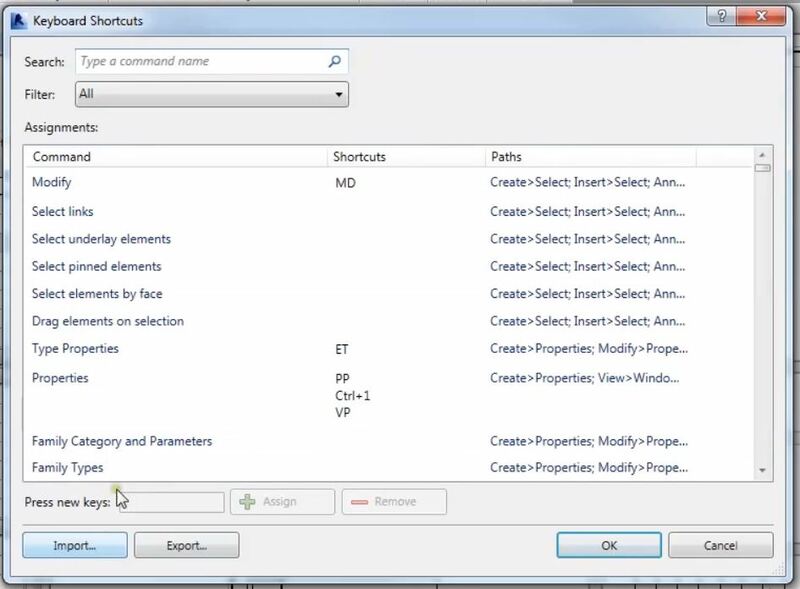 Keyboard Shortcuts (KS): Open the “keyboard shortcut” window to edit your Revit shortcuts. 22. Load Family (LF): Type “LF” to open the “load family” dialog box. 24. Match Type (MA): Select an object. Type “MA.” Select a new object to give it the same settings as the original object you selected. 25. Move (MV): Select the object you want to move. Type “MV.” Drag your mouse in the direction you want to move the object and type in the value you want to move it by. 26. Paint (PT): Type “PT” to quickly access your material browser and paint surfaces. Keep in mind this will change the appearance of a surface, but not the actual properties. 27. Edit Linework (QW): Type “QW.” Go to the line style dropdown menu and select what style you want your line to be. Then click on the line you want to change. 28. Scale (RE): Select your object. Type “RE.” Select the base point. Select the reference point. Drag the mouse in the direction you want to scale. Then type in the new value. 29. Filled Region (RF): Type “RF.” Select your line style from the dropdown menu and select the pattern from the properties box. Then click and drag to create the region. 30. Create Rooms (RM): Type “RM.” Click in areas that are bounded by walls to define a room. 31. 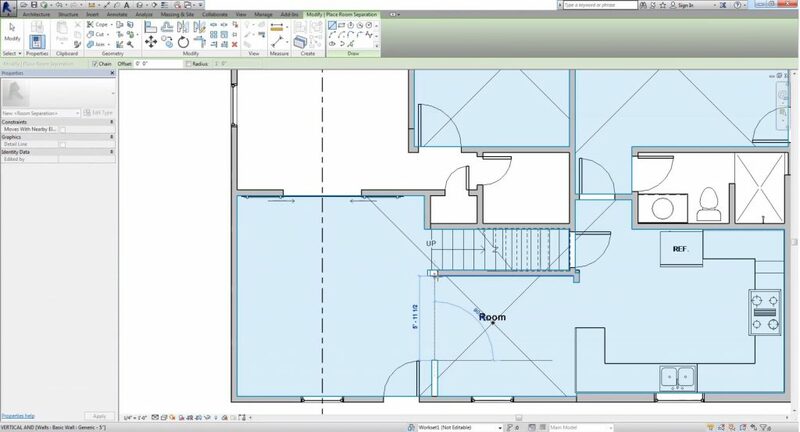 Room Separator (RS): Type “RS.” Click and draw a line between walls to define the room. 32. 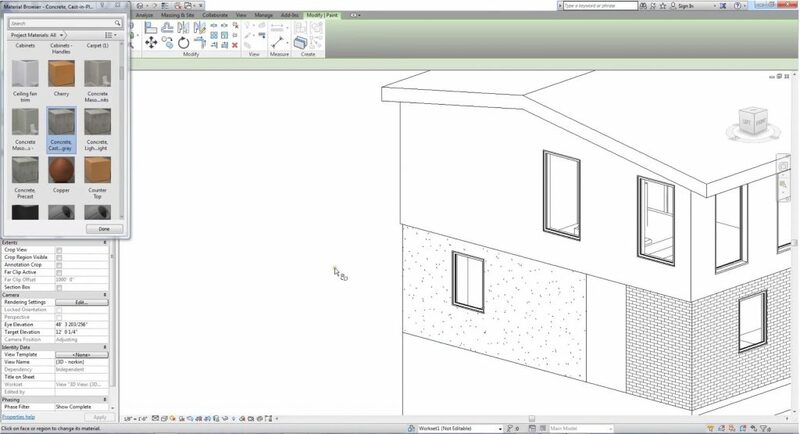 Create a Room That Spans Across a Wall: Select the wall that divides the room and uncheck “room bounding” in the properties box. 33. Rotate (RO): Select an object. Type “RO.” Drag the base point to where you want to rotate from. 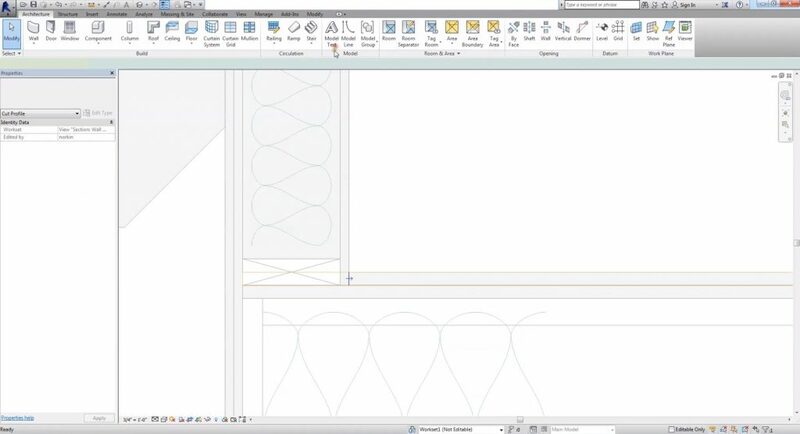 Select the reference line and drag in the direction you want to rotate. It’s best to type in an actual value. 34. Room Tag (RT): Type “RT.” Then click on each room to tag it with its name. 35. Select All (SA): Select an object, then type “SA” to select all visible instances of that object in the current view. 36. Create a Section (SE): Type “SE.” Use the parallel arrows to flip which direction it is facing and double click on the large arrow to view the section. 38. Split Line (SL): Type “SL.” Then click on the line you want to split. 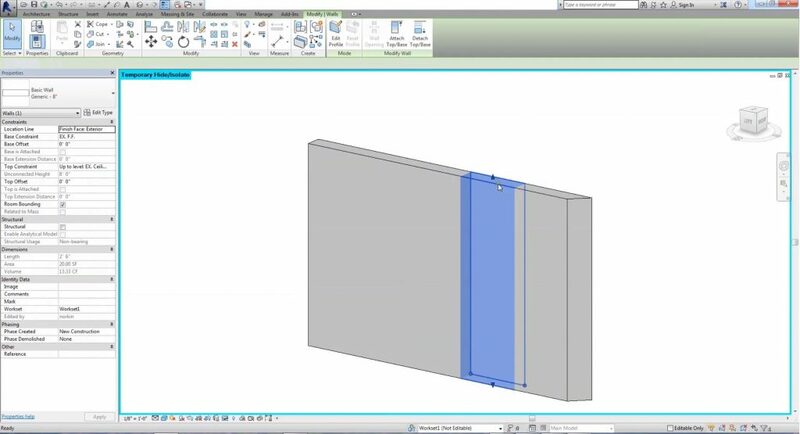 This will divide your model into separate sections that can be altered or deleted. 39. Sync to Central (SS): Type “SS” to open the “Synchronize with Central” dialog box. This is only valid if you are working in a Worksets enabled model. Make sure “user-created Worksets” is checked. 40. Tag Objects (TG): Type “TG.” Uncheck “leader” and click on the objects you want to tag. 41. 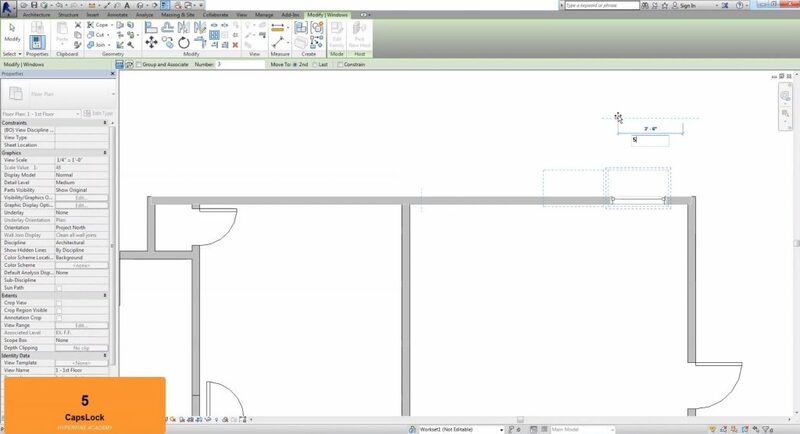 Thin Lines (TL): Type “TL” to view your Revit model in thin lines. 42. Trim (TR): Type “TR” to use the trim tool. 43. Add Text Notes (TX): Type “TX” to quickly add text notes. 44. Visibility Graphics (VV or VG): Type “VV” or “VG” to open the “visibility/graphics” window. 45. Create a Wall (WA): Type “WA” to use the wall command. 46. Create a Window (WN): Type “WN” to use the window command. 47. Wall Reveal (WR): Type “WR.” Set the orientation to “horizontal” or “vertical” and click on the wall where you want the reveal to be located. 48. Wall Sweep (WS): Type “WS.” Follow the same steps as the “WR” command. 49. Reselect Last Selection: Hit “ctrl” + “shift” + “left arrow” to re-select your last selection. 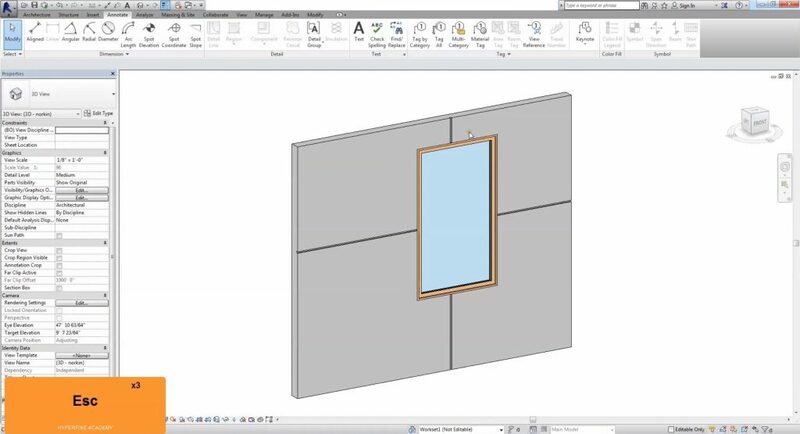 What are your favorite Revit shortcuts to use? Let us know in the comments below!